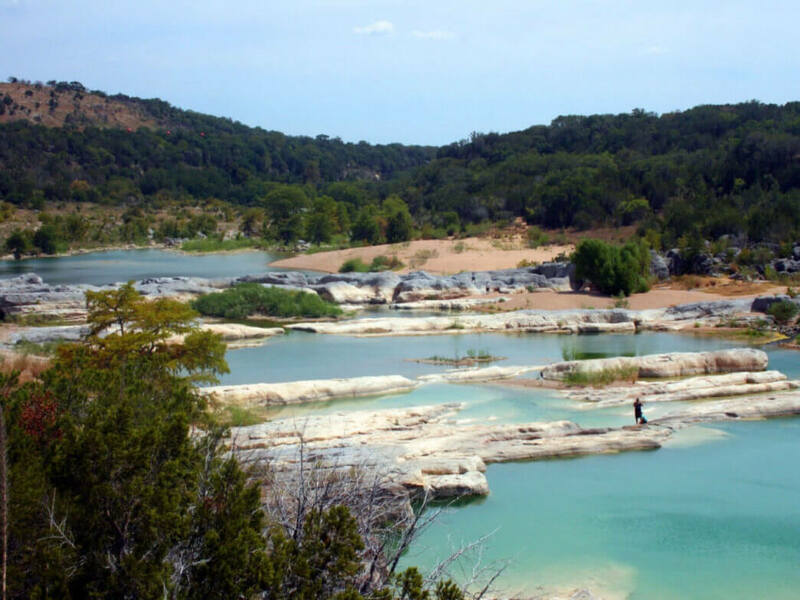 An hour and half Northwest of Pecan River Ranch and deep within the Texas Hill Country, the vast and pristine wilderness of’ Pedernales Falls State Park lures thousands of visitors to take a break from the daily grind and indulge in fresh air, cool streams and majestic scenery. Each year, between 100,000 and 200,000 guests visit this 5,211-acre park with June being the busiest month. If you like getting on trails, Pedernales Falls may fit the bill. Known as one of Texas’ best spots for bird watching, this sparsely developed park hosts more than 150 species of birds, a third of which are permanent residents. Other birds seen throughout the year include ravens, vultures, herons, quail, doves, owls, roadrunners, wild turkeys, rufous-crowned sparrows and western scrub jays. The park’s bird blind is fronted with one-way glass, has photography ports, is handicapped-accessible and accommodates about 15 people at once. Food and water are provided for the birds. White-tailed deer, coyotes, armadillos, rabbits, skunks, raccoons and opossums are common sights in the park. Although it’s not considered a fishing park, the Pedernales River yields carp, perch, bass and catfish; the catfishing is reportedly very good after a river rise. The park’s most well-known attraction is Pedernales Falls, which is seen from the cliff overlook at the north end of the park. There, the river drops 50 feet over a distance of 3,000 feet, resulting in the scenic falls that are formed by water flowing over the tilted, stair-stepped, layered limestones. Opportunities for picnicking, fishing, swimming, hiking, mountain biking, horseback riding (provide your own horse) and bird-watching abound in this massive park. River tubing, wading and swimming is allowed in a limited area, beginning at the youth group area and continuing downriver to the park’s boundary. Park officials stress the importance of watching for rapidly rising water because flash flooding is relatively common in the Texas Hill Country. A popular hike route for families is the quarter-mile trail to the scenic overlook of Twin Falls and the wildlife viewing station. The seven-mile Wolf Mountain Trail wraps around the Tobacco and Wolf mountains, and continues along the small canyons created by the Mescal and Tobacco creeks. Don’t miss out on the cool waters of Arrowhead Pool, where Bee Creek spills into the stair-stepped fall. Short educational programs are conducted by park interpreters, who give presentations about park plants, mammals and geology. For the kids are engaging sessions on Indian folklore, storytelling and sounds of the forest. Check the bulletin boards in the park for times and places. The park is open year-round except when closed for wildlife management. The park headquarters building has a store with supplies, a water-treatment facility and restrooms, some that have showers. For travelers visiting several Texas state parks and historic sites, a Texas State Parks Pass might be something to consider. The pass allows the cardholder and guests one year of unlimited visits to more than 90 state parks, without paying daily entrance fees, in addition to other benefits.